One of the geotechnical structure solutions that we offer here at CMI Structural Solutions is pile load testing. What is pile load testing, you may ask? Essentially, this extremely necessary test will measure the integrity of the deep foundation before the construction process can begin. If you are looking for pile load testing or other geotechnical construction in Webster, look no further than CMI Structural Solutions. Join us today as we discuss the basics of dynamic and static pile load testing. Who knows, it could save you from needing foundation repair at a later date. First Things First, What Is A Pile? The word pile can mean a lot of things as you can likely remember your mother shouting at you and saying “Why is there a pile of clothes in your room?”, but we aren’t referring to that type of pile. 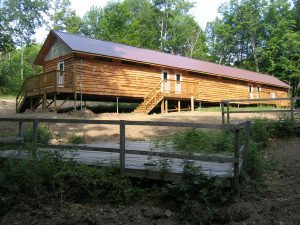 Instead, we are referring to a building foundation technique that is utilized in geotechnical systems. A pile foundation consists of long cylinders of steel or concrete that are pushed deep into the ground with the intention of building a structure on top. When the surface layer of soil is weak, it cannot support the weight of a structure long-term, meaning piles must be utilized to transfer the weight of the building to the solid soil or bedrock below. When a building is high-risk like a high rise, water tower, or electrical tower pile foundations are exceptionally necessary. Piles are an extremely essential structural solution that enables the ability to build structures in undesirable soil environments without risking the need for potential foundation repair days, months, or years down the road. End bearing piles are the concrete or steel cylinder that penetrates the earth, only stopping when it finds an adequate soil strength or rock to rest on. The end bearing pile is the primary support system for structures built in the low-density soil. A friction pile is similar to an end bearing pile in the sense that it is a support for the foundation of a structure, but rather than protruding all the way down to the hard soil, it only reaches partially into the soft soil. Since the end cap pile already has a great deal of the structure supported, the friction pile can manage to support the building by transferring the extra forces into the soft soil. 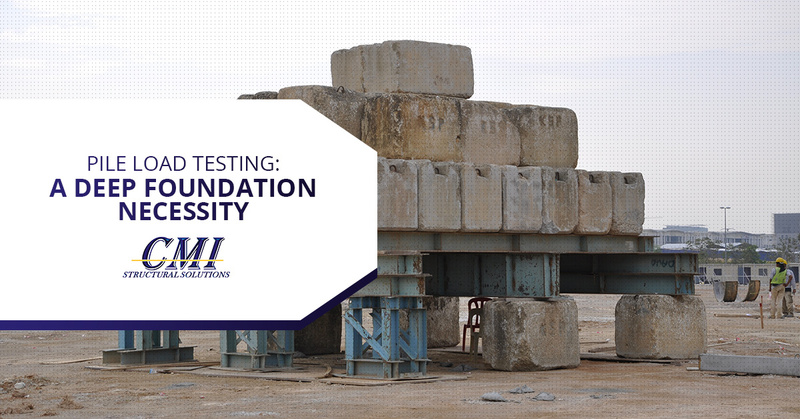 Now that we understand what a pile is and its profound importance in geotechnical construction, it is time that we discuss the methodology of constructing and testing that we use here at CMI Structural Solutions. Piles, being an extremely effective structural solution in low-density soil construction, can be integrated into the soil on a foundation sit in two ways. The first way that piles are constructed is that they are pre-casted at another location, and once the dirt has been dug up and the necessary depth has been determined, they are brought onsite and pounded into the earth. The second method is to caste the piles in the already dug hole. Once the column of soil has been removed, the geotechnical systems team (us) will place a metal form down in the hole and then subsequently fill the hole with high-quality concrete. The most important step in this geotechnical design process is to test the pile that has been installed to ensure that it can adequately handle the stresses and weight of the structure that is intended to be built. Pile load testing can be conducted in two ways, which we have outlined below. Dynamic pile load testing is a testing method where the pile is hit with a hammer and measurements are taken by the geotechnical systems team. First, a strain gauge and accelerometer is mounted to the pile head in order for accurate measurements to be made. After the initial measurements are made, the process is repeated over and over while the team makes adjustments until the perfect fit is made. Static load testing is another form of testing that is performed on the structural solution. In this form of testing, a static load is applied to the pile by a hydraulic jack. As pressure is applied, geotechnical systems crews take measurements in an effort to better understand the amount of strain that the pile can withstand. The difference between dynamic and static load testing is that a dynamic load strikes the pile, almost simulating a dramatic event like an earthquake, while the static load more closely measures how a pile will act from the continuous strain. Both methods are extremely effective, and extremely necessary, for geotechnical design systems. Are you in the process of developing and designing a structural development on low-density soil? If so, let us help you. At CMI Structural Solutions, we provide geotechnical construction services to the Weber and Ontario areas. In order to avoid the need for future foundation repairs, it is essential that you consider the implementation of load-bearing piles that reach through the soft soils to find a harder soil or rock in order to provide a structural solution for your property. Contact us today for our geotechnical design and structural solution services. In addition to structural solutions, we provide a multitude of other services, check them out. We look forward to hearing from you and getting started on your project.